Squeaky Books: I really AM a superhero! Some of you who are members of LittleRedReadingHood.com know that I have an unofficial catch phrase: "I'm like a superhero!" I've programed my cell phone to tell me this every time I turn on my phone, and thanks to Gretchen now I really AM a superhero! If you want to be a superhero, click here. I've always wanted to fly, I'm glad they allowed you to have wings. You can play with this for a while. So many combinations! Have fun, and happy heroing! 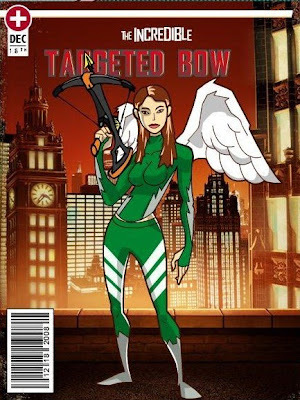 Awesome pants and the crossbow is totally wicked! Ditto Q -- love love love the crossbow.